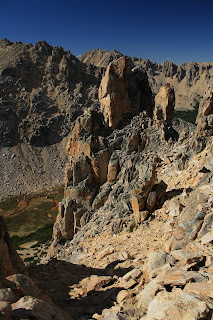 Joel and I have spent the last few days at an amazing volcanic tuff sport climbing area near Bariloche. 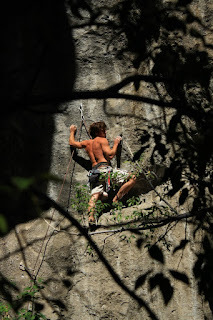 The setting is a lush river valley with great climbing on both sides of the river. Navigating the crossing with dodgey inflatable rafts was an interesting exercise in balance and rather adventurous! The climbing here is wild, very steep, often with great hueco jugs and pockets. Grabbing a huge hold on overhanging terrain and cutting the feet loose awakens instincts from our ape-man roots; hard not to let out a monkey call!! 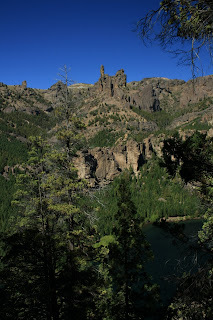 The ambiance of the forest and bulbous tuff towers adds to the primeval aura of this wonderful zone. Stay tuned as we head North for the last part of our adventure, Arenales, a high alpine granite area near the wine capital of Mendoza! 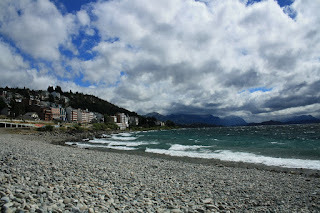 Watching fashonable Ladies trip in their high heels outside the internet cafe here in Bariloche is a far cry from the Southernmost reaches of Patagonia. Neil and I haven´t connected to Morpheus for a couple weeks and it´s been longer since we posted. After the last post, Feb. 16, we prepared for one last trip into the enchanting Torre Valley. A short 24 hour weather window bracketed by precip. and strong winds continued to look promising as the meteogram´s forcasting models for the South Pacific became current reality. We packed four days of food into the large packs, planning on combining a short climbing trip with a gear retrival mission. Approaching with clear skies and warmer temps raised our spirits and we focused on the possibility of climbing in the mountains again. After two weeks of malo tiempo and as much sport climbing as we could fit in between torments, we were brimming with energy. The fact that there was The North Face/ National Geographic sponsored Sender film crew at Niponino high camp added to the tangible vibes. 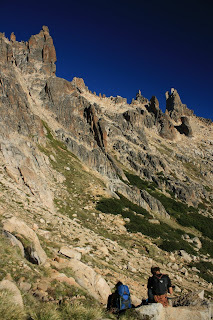 An uneventful hike in found us surrounded by North America´s best climbers and a few from Belgium as well. 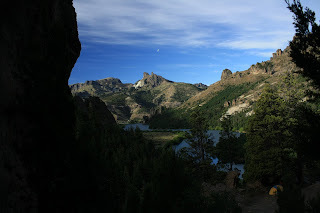 As we repacked for an attempt on quatro dedos (four fingers) the following morning, our attention was intermittenly drawn to the show on Mochito, a wall above Niponino. With the naked eye we spotted climbers, riggers, and film crew working toward a common goal, getting first ascent footage for a new film series by Sender films to air on National Geographic network next fall. 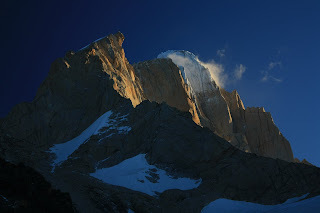 One renowned patagonian climber later wondered if his vommiting on top of Mochito was the mountain´s revenge for the fact that they were rigging from the top, down, instead of bottom, up (an ethical debate as old as climbing itself). Back at Nipo we were greeted by live folk music and the hysterical beat box lyrics of Cedar and the Belguim duo, Niko and Sean playing the mandolin and flute, respectively, and Mason on the banjo. Rounding out the mountain jam session, there was an assortment of dirtbags beating on pots, mandolin cases, and playing mouth harps, and one recyled material fashioned trumpet. As Cedar´s lyrics divulged the life of longtime valley dirtbag, ¨Chongo¨ Chuck, beating all slowest speed records for walls around Yosemite Valley, and life on the road, we nodded in agreement and sporadically chimed in with our own truths. The essence of the brotherhood was captured that afternoon. Meanwhile, two climbing teams with two different goals, dropped the clutch high above camp in an attempt to beat the onslaught of Patagonian weather. The first team, Fixed Pin and Extra Hard, left their headlamps at the base in an attempt to cut weight for their ascent of Media Luna (see pics of Neil and I climbing this formation in the posting from Jan. 1, 2009), essentially giving the middle finger to anything except perfect harmony, a state proved by Newton that rarely exhists in the universe. More on this unfolding epic later. The second team consisted of Sean, a California BASE jumper and Valley climber who led every pitch of the Benetier route (route name is French for the basins that hold holy water; see post from Life on El Mocho for a pic of Leighan drinking from one of these basins on top of the route), Nick, Sender films owner and jumarisimo, and Chad, of the famed YOSAR (Yosemite Search And Rescue). These guys want footage of Sean BASE jumping off a divingboard feature on top of El Mocho, a feat only Dean Potter has succeeded in, only Dean wasn´t wearing a squirrel (wing) suit. Back in Nipo, the jam session had ended and the high cirrus clouds and increasing winds continued to give the afternoon an erie feeling. 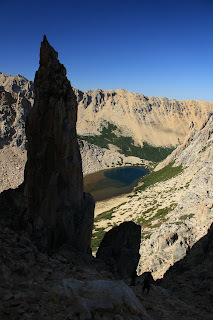 TNF crew was in radio contact with El Mocho crew and we watched in anticipation as Sean, belayed out to the edge of the diving board, dropped the biggest rocks he could move over the edge in an attempt to calculate the exact distance before the wall slabbed out. This measurement (multiply gravity: 9.8m/sec. and the time it takes for the rock to hit the slab) must be at least five seconds in order to provide enough lift and room for error for the wing suit to gain a horizontal trajectory. The Brotherhood was hoping that Sean would come to his senses and rappell the route, saving the BASE jump and squirrel suit flight for another, less windy day. This is f%@#$%" Patagonia afterall, the wind here has been known to drive people insane and by the looks of the stacked lenticulars above the pampas, it was still increasing. TNF crew with the radio had headed out onto the open glacier to prep a Landing Zone and the dirtbags assumed that they would call it off and come down. That would be the sensible thing to do, right? We thought so, until we heard a yell and looked up to see Sean flying away from El Mocho with a very horizonal trajectory. This is the first time I´ve ever seen someone gliding in a squirel suit outside of YouTube. The flight was perfect as Sean soared down the valley. It was when he pulled the chute that the trouble started. Maybe Sean pulled his chute too soon. The converging glacier systems and associated turbulent wind drafted his small BASE chute upward. Usually, these smalls chutes descent 1m for every 10m horizontal. However, the giant updraft quickly had Sean looking down on his cohorts on El Mocho. We watched as he circled, attempting to descend, only to have the thermals take him higher. A couple times his chute quivered as turbulent winds tried to collapse the small chute. Sean eventually realized that flying down glacier was the only way out of the rising air. A Condor appeared off Sean´s right wing as if to guide him safely back to terra firma. Shortly aftrerward, he was flying back up the glacier toward the LZ, much lower now. We ran out onto the glacier to greet him after a safe landing. Sean was eccstatic. His helmit cam caught the whole flight while camera men strategically placed on El Mocho caught the action as well. We were psyched that he made it down. Sean has squeezed the jump into the last possible lull in the oncoming storm. Within an hour it was raining. We watched trhough binoculars from our boulder strewn camp as the support team battled sideways rain and stuck ropes while rappelling. Night soon fell with the film crew and our two friends on Media Luna still high on the wall. Fortunately, the film crew had headlamps and made it to the ground albiet soaking wet. Sean hiked up to help the crew back to Nipo. Meanwhile, on Media Luna, F.P. and E.H. had to cut their ropes on the first rappel. They were left with two 15m sections and darkness caught them midway down the wall with no headlamps in the pouring rain and wind. They had no Gore-Tex and relied on the synthetic fibers of their belay jackets and soft shells to insulate when wet. They found themselves using the camera to take pictures of their single point anchors to assess their ERNESTness or lack their of... They left much of their rack behind and F.P. rapped off the end of the rope mere meters from the ground and slid to a stop partially in a crevasse, but they made it down safely. These guys walked into Nipo around 0300 thourougly worked and happy to be alive. The following day we looked over thier photos and drank lots of maté and coffee before packing up the large packs with all our gear including 12 ice screws and vertical crampons and headed out of the Torre Valley. Unbeknownst to us while we hiked out, an Argentine climber and partner had nearly summited Poincenot before being turned back by the same storm. The epic that played out over the next 30+ hours left the community mourning the loss of a young, vibrant, persona. The rescue efforts were too late to save this climber deep in the grasp of hypothermia. We had many questions, but not too many answers. By our deductions, a chain of events occured in which if one had been different, he would have survived. Lesson learned. This recent development affected our descision to tone down the last climb for an attempt on the moderate Comesana-Fonrouge ridge on Guillamet. Neil and I teamed up with John Gleeson from YOSAR and had a really enjoyable couple days in the mountains. 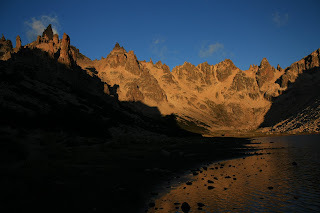 It was our first trip to Piedras Negras (Black Rocks), which is the high camp for all climbing North and of the East Face of Fitz Roy. Our landlord, who also owns a taxi service, gave us a ride out to the trail head. 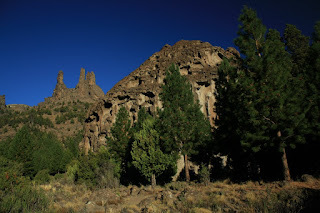 From there it´s an ejoyable two hour hike to an estancia where the uphill starts. A couple thousand feet later and the Fitz Roy Massif is quite tangible. After a cold bivy (20deg. F), we woke with the sun and climbed some short approach pitches in mixed snow and rock sans crampons to the ridge proper. At this point, the views open up and we looked down upon Pier Giorgio, Aguja Pollone, and onto the South Continental Ice Cap. The Cerro Torre group peeked around the side of Fitz Roy. The Fonrouge Ridge offered great moderate climbing in an oustanding setting. We simulclimed all but two pitches and arrived at the Cumbre at 1400. One cannot stay on the summit forever... We rapped and ran out to the road and were back in our beds in El Chalten by 2300. 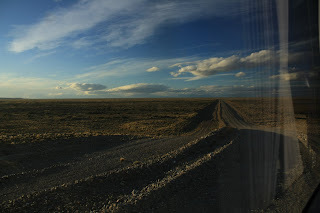 We had purchased tickets with the bus company, Taqsa, North on Ruta 40 before heading into the mountains. All we had to do before getting on the bus was clean our casita, pay for the broken window, and bake some empenadas for the road. 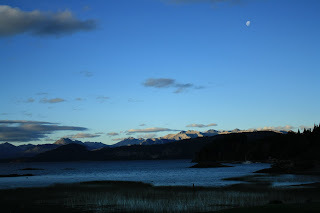 After 35 hours on the bus we arrived in Bariloche and promply went to the Frey with our Argentine friend Ceci. We were served three of the highest quality routes the place has to offer. First, Imaginate on the Slovenian Pillar led by Neil. Next, Sinestra Total (total scare) on Torre Principal led by Joel, and lastly, Objective Lunar on the Lunar Rocket led by Neil. We´ll have to share the specifics of these on the next posting, but the pictures say it all as we went from the world of ice and rock to lotsa Sol, no shirts, and amazing metomorphosed granite.